Amidst the growing distress in the rural economy and never attended to grievances of the farmers in the country the scheme is more interested in setting moral yardsticks for measuring “development” than attending to the prevalent socio-economic and political problems. 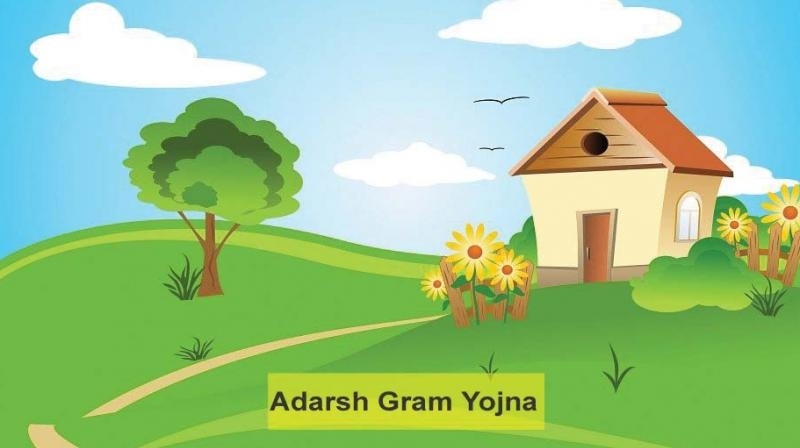 Saansad Adarsh Gram Yojana (SAGY) is one of the first schemes that the Prime Minister Narendra Modi announced in his first Independence day speech on August 15, 2014. The scheme that was announced along with ‘Digital India’, ‘Make in India’, ‘Pradhan Mantri Jan-Dhan Yojana’ just like them has remained to be a mere set of magical words on papers. This scheme which claims to strive towards “keeping the soul of rural India alive” was launched on October 11, 2014. The scheme promised the implementation of the 21 shortlisted government of India schemes along with the state government schemes with the support of different ministries, departments and the private sector (Corporate Social Responsibility). The MPs would utilise the funds allocated under Members of Parliament Local Area Development Scheme (MPLADS) for implementation of the scheme. Even before getting into the implementation of the scheme, a look at the disinterest shown by the parliamentarians in adopting villages shows that the scheme is a failure. While 703 MPs adopted villages in phase I, only 466 out of 786 Parliamentarians identified villages in phase II and the reports say 612 out of 784 MPs from both Lok Sabha and Rajya Sabha have not yet identified even a single village under Phase III. Lok Sabha members from 13 states/UTs and Rajya Sabha members from 16 states/UTs have not identified villages in phase III. In Uttar Pradesh (UP), out of 108 MPs (both houses), 56 per cent have not adopted villages. In Maharashtra, 88 per cent of the 67 MPs have so far not identified villages for adoption, says a report in Down To Earth. The scheme has no fund allocated by the center and the MPs are expected to utilise MPLADS in implementing all the 21 ongoing schemes in the adopted villages. For example, according to the data of MPLADS, Rs. 3564.85 crore was released by GOI as MPLADS for state of Tamil Nadu. The MPs from the state are expected to make use of this money along with CSR funds to implement all the 21 schemes. This is an impossible task. If the story of MPs not identifying villages is a bad story the story of the failed implementation is even worse. A committee headed by T M Vijay Bhaskar the Karnataka State Chief Secretary examined the implementation of the scheme in the state. The findings of this review says, the scheme has utterly failed to be implemented in the state. Also Read: Explainer: Why is India’s Agriculture in Crisis? 56 villages were adopted by the legislatures in the state in three phases. The report says, it is 2018 and none of these villages can be called “Model Village.” In phase I of the scheme 39 legislators had adopted 39 villages and in the phase II 16 legislators did. However none of the villages have even had a Village Development Plan (VDP) which is one of the initial steps in implementing the scheme. In phase III Nirmala Sitharaman has adopted a village and has decided to implement 50 VDPs and the report said none of them have started to be implemented. The infamous Vijay Mallya, a former MP from the state, who is in hiding due to the charges of money laundering had adopted a village and had proposed 69 VDPs and out of which 55 have been completed. Except for this village, none of the other adopted villages have seen any progress. Based on Mahatma Gandhi’s idea of “Swaraj to Su-Raj” (self rule to good governance) and conception of an “ideal village” the scheme placed the responsibility of making five ideal villages of total 6,40,930 villages (as per the 2001 Census, there were total 5,97,464 inhabited villages in India and the 2011 census say there are total 6,40,930 villages in India) on the MPs. There are total of 786 MPs- in phase I, 786 out of 5 lakh villages were to be adopted and in the phase II, 1,572 villages had to be adopted. The scheme thus, is absurd and mere symbolic. The PM in his speech had said, “If we provide one model village in each district of India then the surrounding villages shall be automatically inspired to follow that model.” The idea of creating a “Model Village” and expecting the 5 lakh villages to get inspired and replicate the models of development is faulty on many grounds. First, expecting villages to take up the responsibility of “development” is for the government to stay away from its duties; second it shows its approach towards the rural economy and its problems, which is to blame the communities for their conditions; third, the PM gave a call to make a Model Village to develop rural economy. He had said, “ If we have to build a nation, we should start from the village. Make a Model Village.” However his government's policies broke down the very support structures that the rural development had in the country. The government by undermining the legal and financial framework of MGNREGA and weakening the provisions of the land acquisition act and large budget cuts in the rural development is invested in promoting SAGY which is nothing beyond a symbolic scheme. It thus acts as a placard, which says “Model Villages” that the government flashes whenever critiqued for neglecting the rural areas. The scheme for those whose destiny has always been played with by the governments in power, talks about nurturing the values of national pride, patriotism, community spirit, self confidence and developing infrastructure. Amidst the growing distress in the rural economy and never attended to grievances of the farmers in the country the scheme is more interested in setting moral yardsticks for measuring “development” than attending to the prevalent socio-economic and political problems. A report in the Indian Express noted, schools without teachers and infrastructure, hospitals without staff and medicines, villages without water and electricity, no funds for MGNREGA, unpaid IAY installments, no accountability, no grievance redress, and the continuing distress of caste/ gender/ socio-economic oppression are all set aside, for the grand spectacle of adarsh gram. Finally in his first Independence day speech the PM on explaining what SAGY aims at and its implementation had asked, “Can`t we do at least this? Shouldn’t we do this?” The reviews and reports of the implementation and failure of the scheme has an answer.